This picture was sent by a friend. 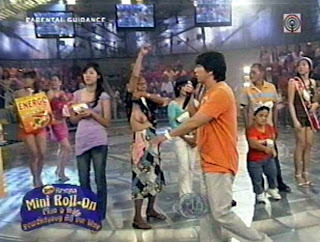 At yesterday's Wowowee Show, the host, Willie Revillame was looking for the Rexona girl for the day. The Rexona girl -Rexona being a deodorant- should obviously possess the less blemished armpit. There were various contestants - women of varied ages. When Willie asked the contestants to show their blemish-free armpits, lola (grandma, old woman) did! This was on live national television. The incident sort of made me feel sad, for lola. In her want to win some cash prize, she forgot - or did she? - that she was braless! Even if she was wearing one, raising her blouse to show her armpit would have make her look like an old-saggy-bold-starlet-desperately in need of money! I am a lola !! Will I regress and be like that one day? Heaven forbid! - I will need a bust-lift! That is so sad! Need for money can make people do anything. All of us will become old and probably will experienced situations like or even worst. I first laugh when I saw the pic but upon reading your post... ok, that is not funny. I am passing on an Award I received from a blogging friend to you. I am not sure if this would be the second time that you're getting it. But just the same I am happy to pass it on to your blog. I didn't saw this one. I felt sorry for the old lady, did they even give her a anything? Did she won the prize? mommawannabe: yes, i agree that the need for money pushes you yo do extremes. towr: yes, i laughed too when i first saw the picture but when i had the chance to think about it, i was saddened by what happened to her. levy m; I don't know if she won any cash. hope they deleted it when then replay the show here. di ako nanood today ng www, eh. kawawa naman c lola. yeah, wala na yung pr ko. no clue how they do pr's. they just come and go. shimumsy: my PR is back. girl: kaya nga... habang bata pa mag pa bust lift na, just in case. Sis, thanks for stopping by and your affirmation. This entry caught me off guard. Kawawa naman si lola, I wonder how willie and the rest of the audience responded. I seldom watch tv these days. Aside from the fact that blogging takes a lot of my time, it's totally frustrating to watch all those withstanding issues. hey jennie, i also don't have the time to watch local shows. call me a snob but watching most local shows is a waste of time. tnx for the hop and God Bless!